LONDON -- Pressure, heat of battle, mind games; they are all key elements of every title battle, apart from when a team wins the Premier League by 19 points and leaves the rest trailing in their wake. Manchester City were so utterly dominant last season that the usual rules of engagement did not apply to Pep Guardiola's team. Indeed, such was City's brilliance that the "race" for the finish line became more a procession rather than an examination of their credentials. 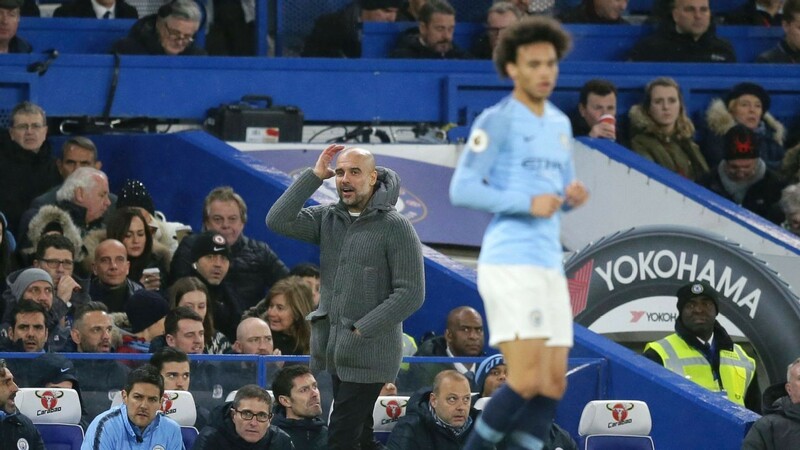 But after Chelsea's 2-0 victory over the champions at Stamford Bridge on Saturday, the missing ingredients are back where they belong and City now face a different test if they are to retain their crown at the end of this campaign. This season will be about pressure and how the leaders deal with it. "The objective is to get one more point than our rivals, but at the moment, Liverpool are better than us," Guardiola said. "Yesterday, we were favourites, but Liverpool are favourites now. They are top and they are unbeaten. Our level is similar to last season, but our opponents are stronger. "There is no sport in the world where one team is always winning," the City manager continued. "That is an illusion. Part of the competition is that you can lose. We dominated possession [against Chelsea], had a thousand-million passes, but Chelsea beat us by scoring on the breakaway. That is what happens." Every title race has a defining moment that marks a fork in the road for the teams involved at the sharp end and it will take something hugely significant to top Divock Origi's stoppage-time winner for Liverpool against Everton last week. N'Golo Kante's strike for Chelsea vs. City, moments before half-time and after his team had been swamped by Guardiola's men for the previous 44 minutes, was clearly another big moment as it put Maurizio Sarri's team on course for the win that inflicted City's first league defeat of the season. Manchester City have only dropped seven points this season but find themselves second in the Premier League. The net result of those two moments, as well as David Luiz's second-half header, is that Liverpool's title bid has been given a turbo boost with his last-gasp winner and made City realise they are locked in a genuine fight for the title. Had Origi not nodded home in the 96th minute of the Merseyside derby, City would have gone into last midweek's fixture list with a four-point lead and the psychological advantage of seeing their closest challenger slip. Instead, they had the pressure point back upon them. Liverpool's fighting spirit and never-say-die resolve propelled them forward into subsequent victories at Burnley and Bournemouth, meaning City with no margin for error at Watford and Chelsea if they were to retain top spot after 16 games of the season. Guardiola's side emerged with a hard-earned 2-1 win at Vicarage Road, but could not translate dominance of territory and possession against Chelsea into the victory that would have inflicted a blow to Liverpool's morale. Instead, City lost and Jurgen Klopp and Co. sit on top of the table, one point clear and with the league's only remaining unbeaten record. The emphasis now shifts to Liverpool, with the focus on whether they can cope with a different kind of pressure: Can Liverpool lead, with City snapping at their heels? It is a test they have not yet experienced and any title-winner will tell you there is a huge difference between being on top and staying on the leaders' shoulder. Some players and teams thrive in front, while others feel the hot breath of their rivals and it leads to mistakes, lapses of concentration and the kind of wobbles that should not affect a Premier League footballer at the top of his game. Liverpool's ability to keep pace with City and apply constant pressure has denied Guardiola's players the freedom that they experienced last season, when their nerve ends were never frayed by the result of a rival team, simply because they were so far ahead of everyone else. By contrast, the draining effect of seeing a challenger pull off a late win can gnaw away at even the best teams and City, in losing at Chelsea, have shown that they are not immune to such pressures. They will probably bounce back by taking out of their frustration on also-rans, but Liverpool have also been beating those teams. They have marched step-by-step with City this season, but now it is their turn to lead from the front; it will be intriguing to see how they cope. As for City and Guardiola, their challenge is more straightforward after Chelsea ended their chances of going unbeaten in the league this season. "I said again yesterday (Friday) that that [unbeaten in the league[ is not going to happen," he said. "We are not here to be Invincible; we are here to be champions."